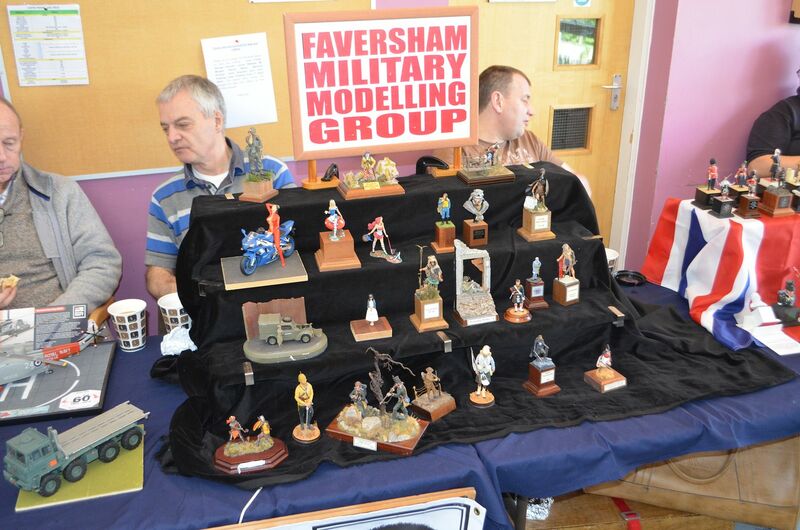 Probably the quickest show I have been to...it really wasn't that big - a few stands, a couple of games, a couple of re-enactors and a coffee van parked outside. 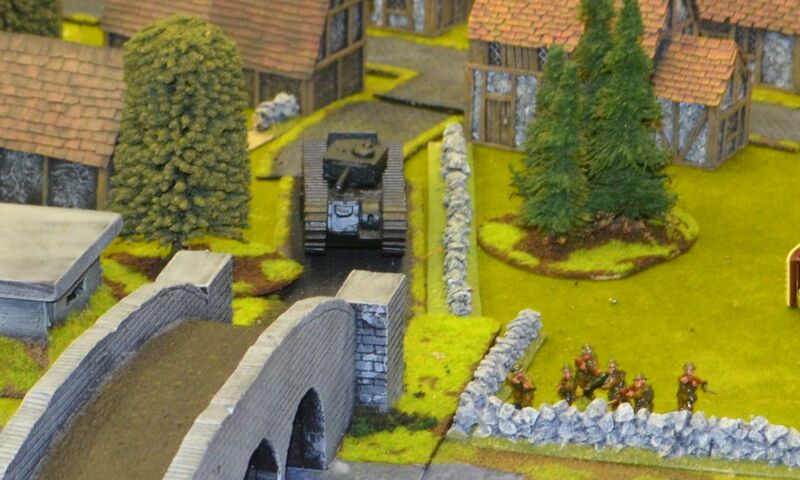 I bought a some cheap resins walls (not that I need any more) and some paints - roll on Salute. 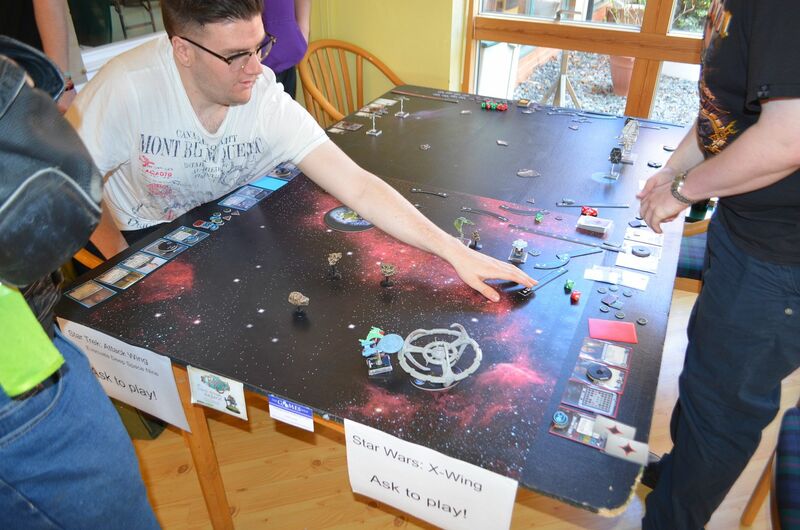 I also had the fortune to meet Legatus Hedlius (http://legatuswargamesarmies.blogspot.co.uk/) - his blog is always a great read... we met and said hello and an invite to the shed was cordially given. There were more people there when I left ! 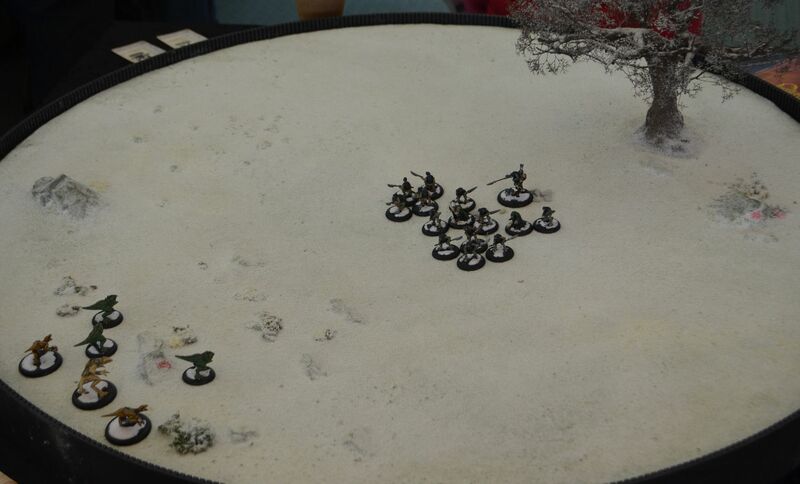 There were a few games on display but I do wonder about the merit of slinging out a few trees and lead pieces on a green table top. 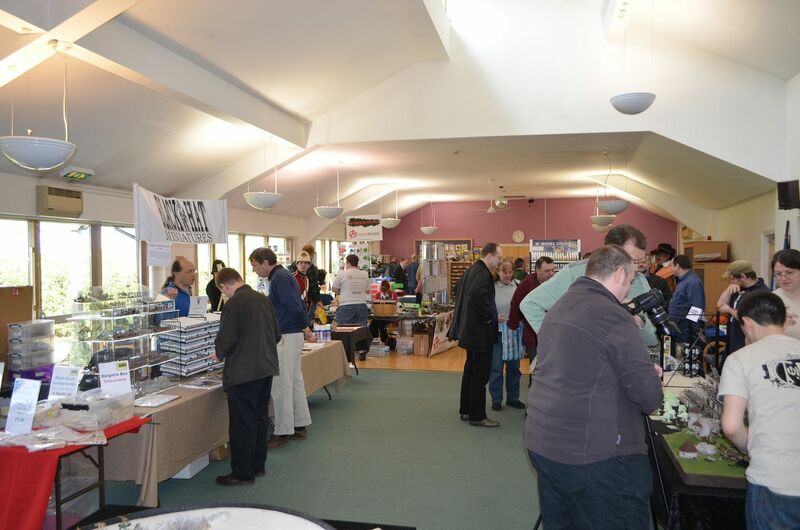 If these events are there to drive interest in the hobby there really does need to be a concerted effort by organisers to put on the very best displays. I have left the best til last - seriously. These are really nice models look a bit like the creatures from that Jim Henson movie - its not labyrinth but I can't place the name. Yesterday I celebrated my 49th Birthday – can’t believe I am almost half way to a century! I am however chuffed to bits with one particular present I received last night from my wife. What is this I hear you cry? 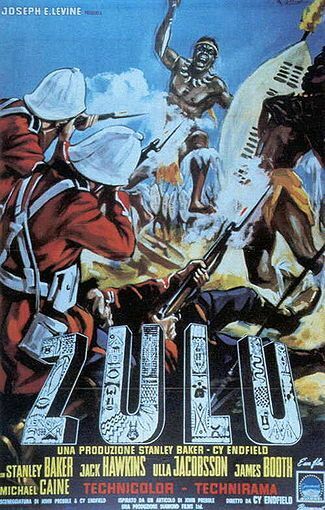 She is well aware that my favourite movie ever is Zulu, I recall fondly the very first time I saw this movie in the cinema with my father and brother in the early seventies and since then I have never been able to see the movie again on the big screen but that is all about to change. 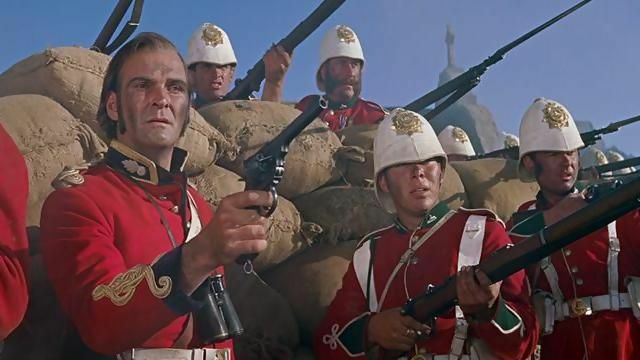 On the 10th June at Leicester square will be a 50th anniversary screening of this Iconic movie in aid of the charity of walking with the wounded. I am the proud possessor of two silver tickets. After much soul searching and a load of pleas from my teenage son (he is equally keen on seeing this) I have decided that its only right that I take my old man – not wishing to sound morbid but rather a celebration, I figured it is probably the last chance either he or I will ever get to watch this on the big screen together. Not to sure if tickets are still available but they can be sourced from here. Who knows maybe Michael Caine might make an appearance ! The BUF is steadily making advances south down the Old Portsmouth road – its strategy is two fold. Firstly it wants to sever the supply links from the Anglican leagues heartland in the East and their forces in the west, and secondly, it wants to try to wrestle control of Portsmouth from the Communists. By spitting the Anglican leagues forces in two it aims to deliver the knock out blow and force the renegades to the negotiating table. Pivotal in this plan are the southern rail links, specifically the London Portsmouth line. 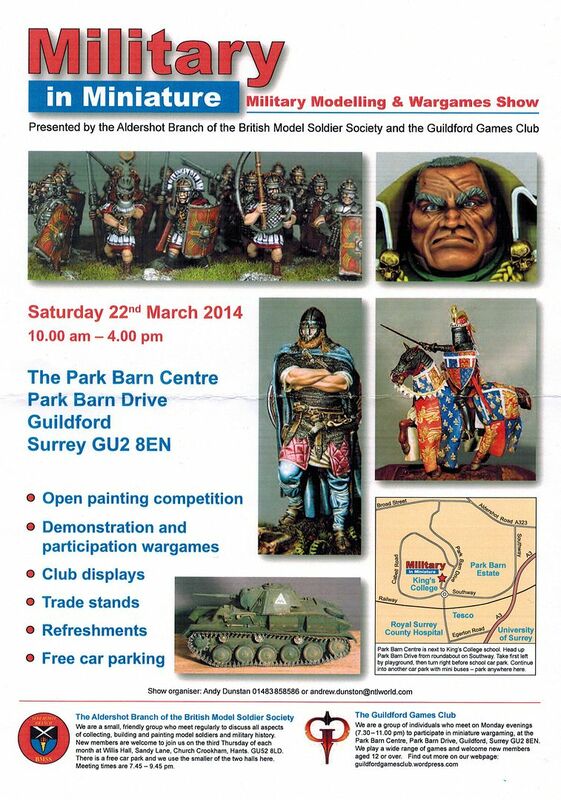 Our scenario takes place in near the village of Farncombe, near Godalming surrey. The Village lies aside the river Wey and two key bridges cross at this point. 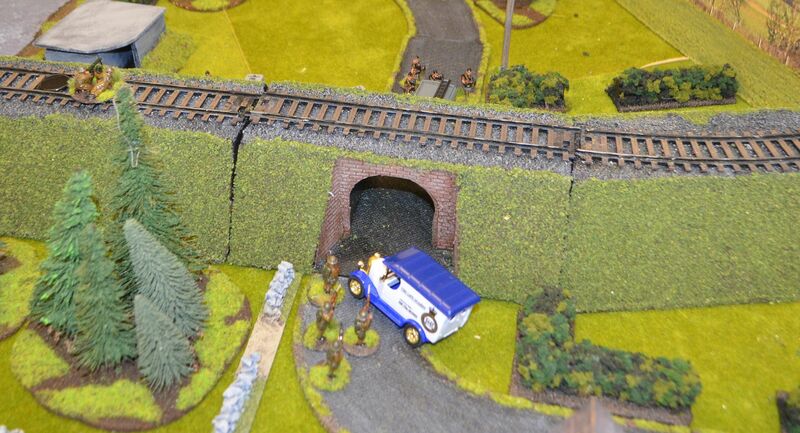 The BUF mission is simple - take the bridges and secure a bridgehead on the South side of the river. 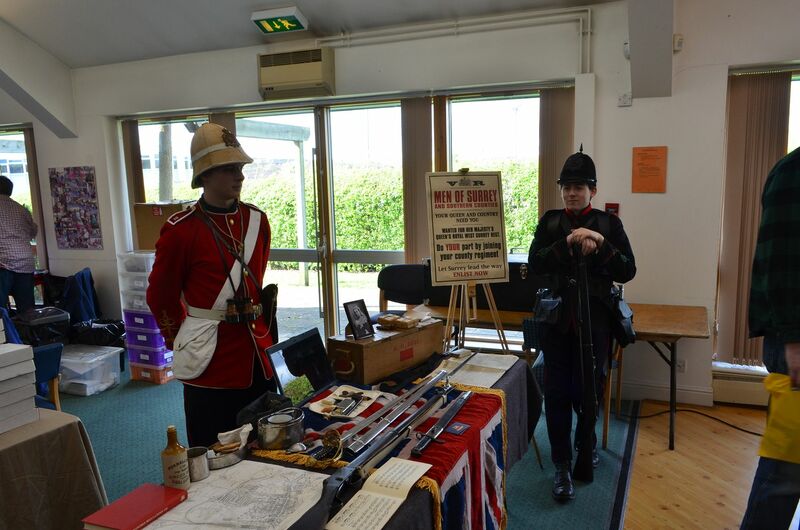 The BUF can expect some stiff resistance from local Anglican League volunteers troops. 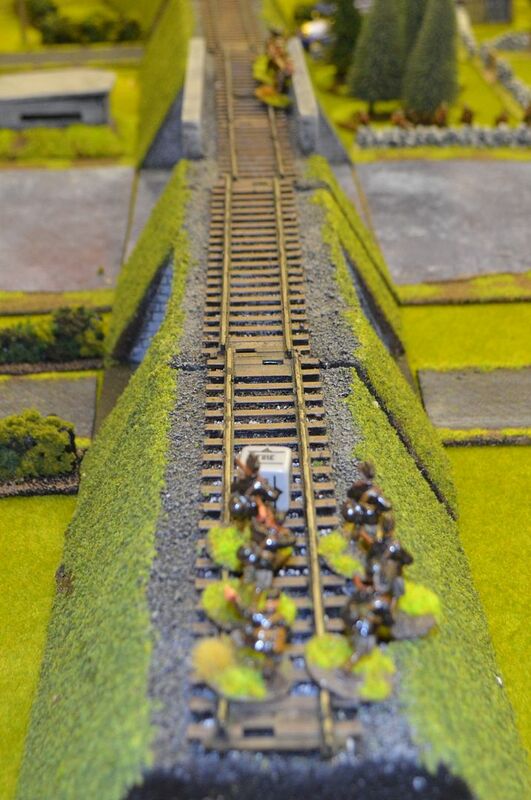 The BUF forces have pushed forward in some strength along the Northern Road in tow columns.. Last night the commander on the ground sent a flanking force to the East. 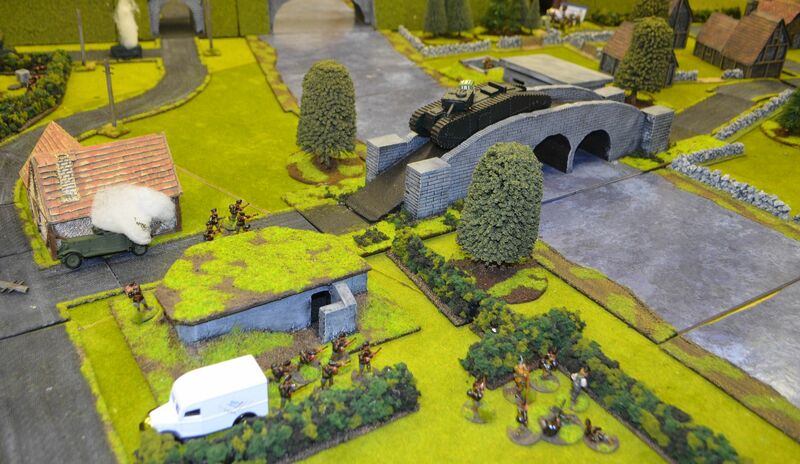 These are expected to join the battle at some point in time to the East on the other side of the river. 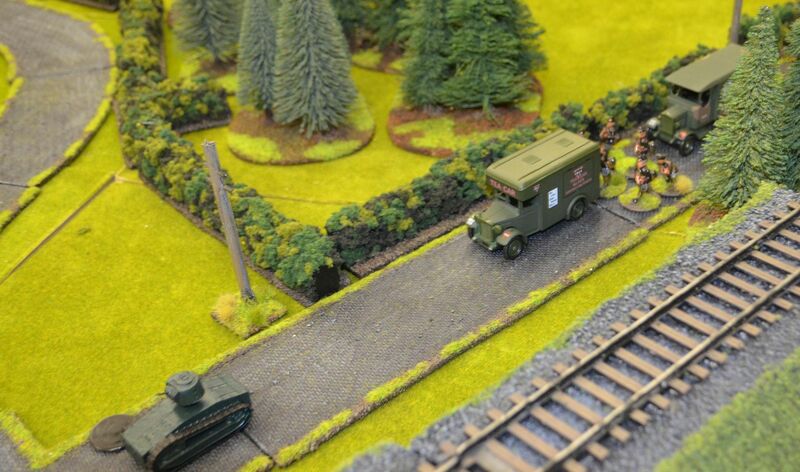 Leading your line are elements of the Mosley Armoured Brigade – two light tankettes and an old antiquated tank called Big Boris – it is apparent that Boris is not going to be able to cross the bridge nor can he scale the rail embankment. 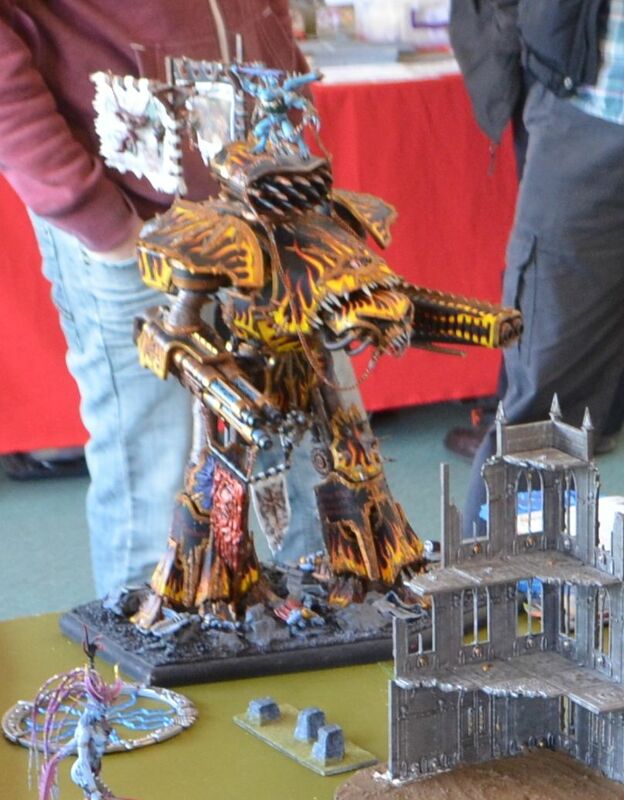 He is merely there for fire support. 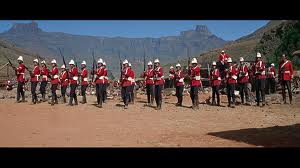 The Anglican Forces opposing the BUF have for sometime expected the BUF to attack Farncombe and have made ready the defence of the bridges. 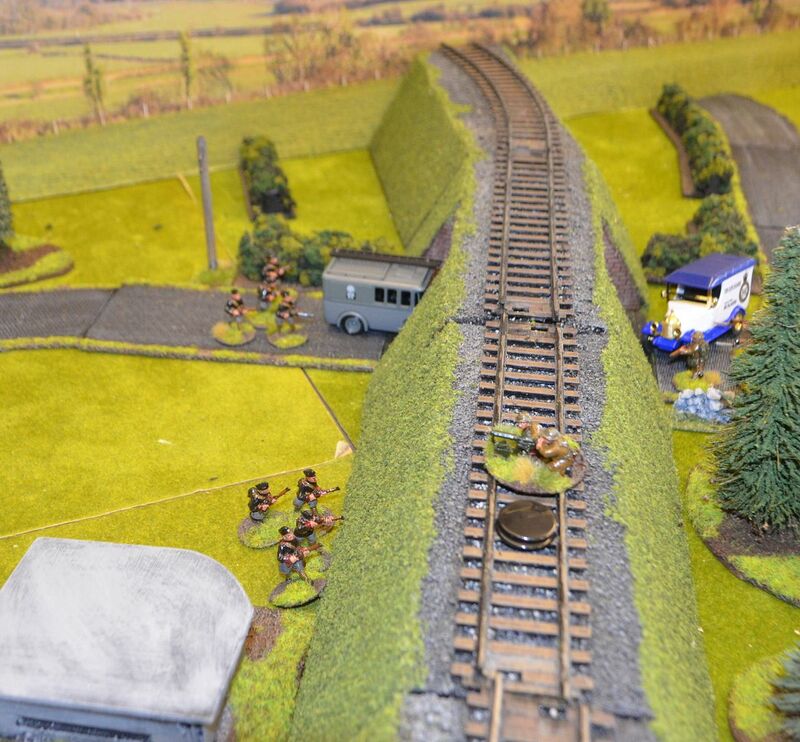 At this point it became obvious that the BUF were never going to get across the road bridge - the railline crossing was in their hands but the Tank on the roadbridge was virtually impervious to fire. 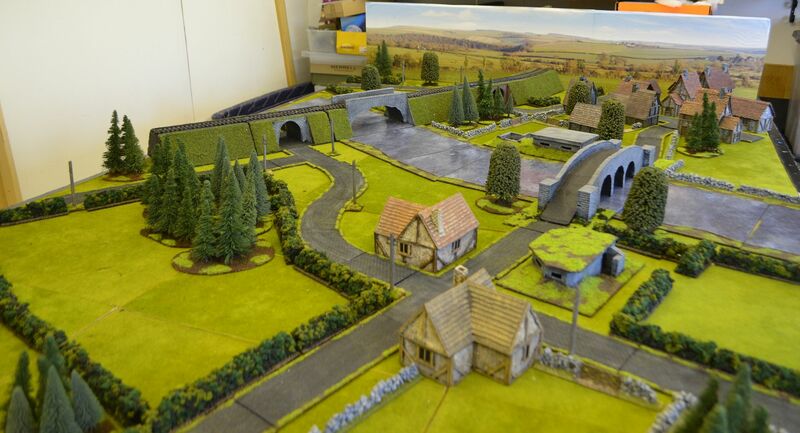 The Shed Wars terrain factory keeps giving ! 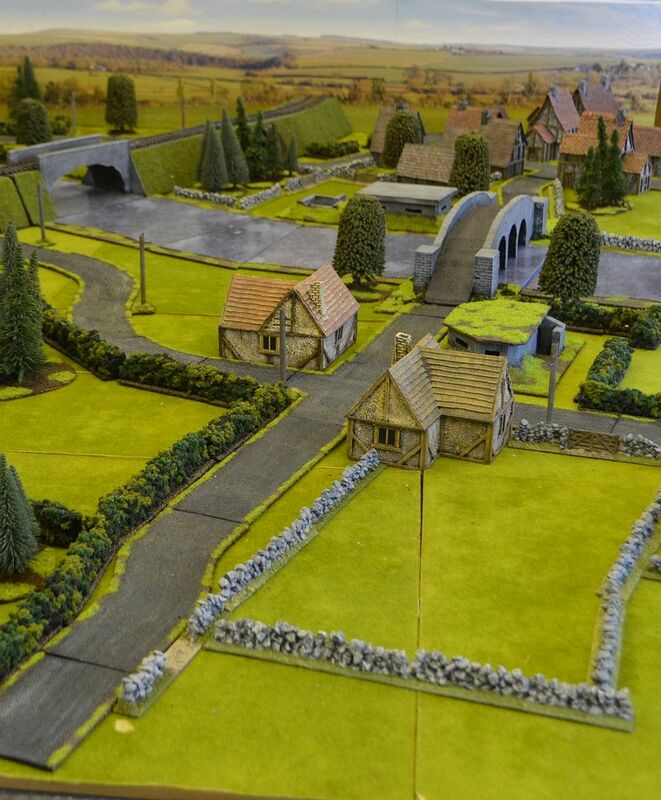 A couple of weeks back when we played our first VBCW game my good friends Mark & Matt suggested that a couple of pill boxes might not go amiss on the table for future games. How could I refuse and my mind began whirring on how such items could be constructed. Again the following outline is not meant to be an exhaustive tutorial but does demonstrate how easy it is to build these defensive structures. In the following photos you’ll see how these have come about and will hopefully provide inspiration for others out there. Before I kick off I should say that my builds are meant to be easy, anybody with a modicum of artistic ability could do what I do, it just takes a bit of planning, the right tools and materials and some patience. If you can rope in others to help even better – despite offering to pay my 13 year old son to do some of the painting I have yet to find a willing helper myself! Virtually all my projects have something in common – they do not start with a plan, I let the image of what I want to do ferment in my head for a few days and then taking the materials I have to hand I start the build. There’s no pre drawings, no sketches and no measurements ! In this particular case I started with the view that I wanted to build three units – each slightly different and ranging in size. 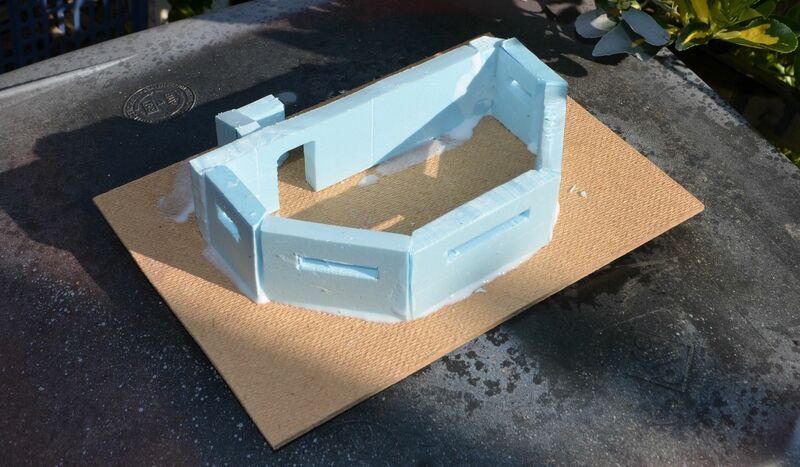 To begin with I was going to build all of the structures from foam core (5mm) but when I discovered some off cuts of blue foam in the shed I switched two of the units into this material. Recalling from memory that pill boxes and block houses can come in a variety of shapes – squares, rectangles and hex style shapes I began to think about the design – again in my head. 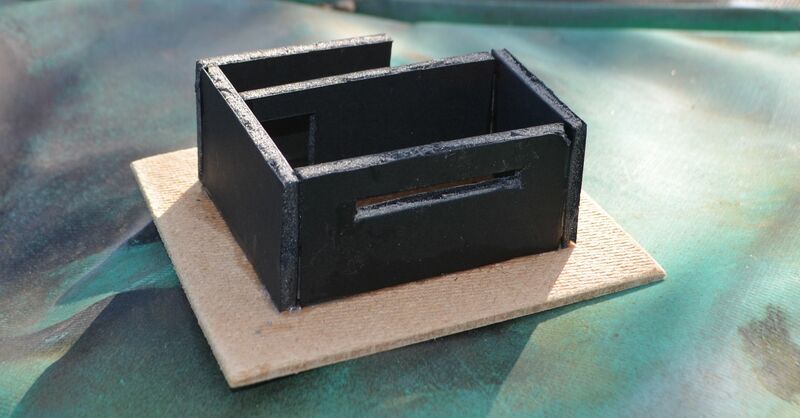 I settled on a height of 4cm, thereby allowing a 28mm mini to stand upright in the finished structure..
Like all my constructs they are based on hardboard – rough side up to give a better key fort the glue. 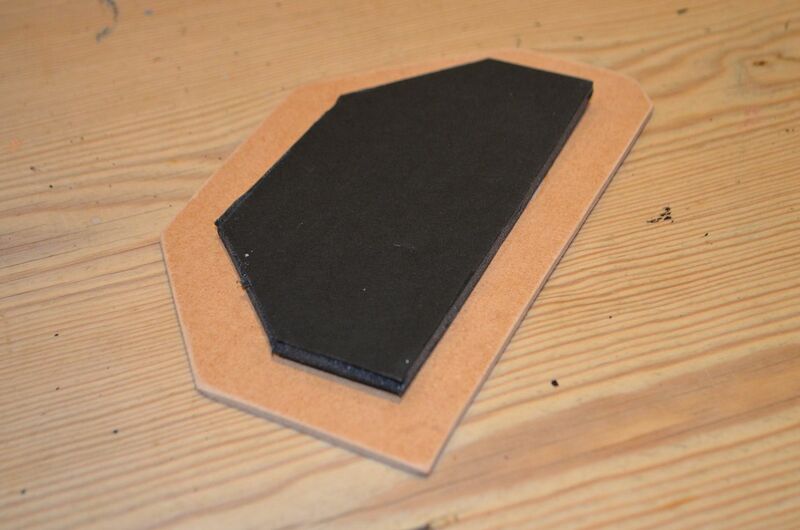 Three bases of different sizes were cut. The shape of the pill boxes themselves were then roughly drawn on the board using a permanent marker. 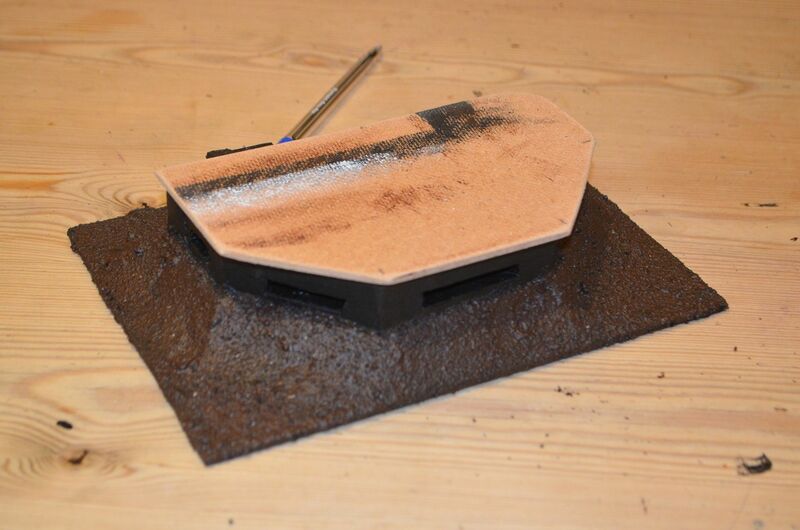 Then taking the ‘wall’ material I measured out the walls and the firing slits. The firing slits were cut out first with a really sharp blade – it is much easier to do this n a larger sheet than the smaller wall sections if they are already cut. Once the slits were done the walls were cut out. 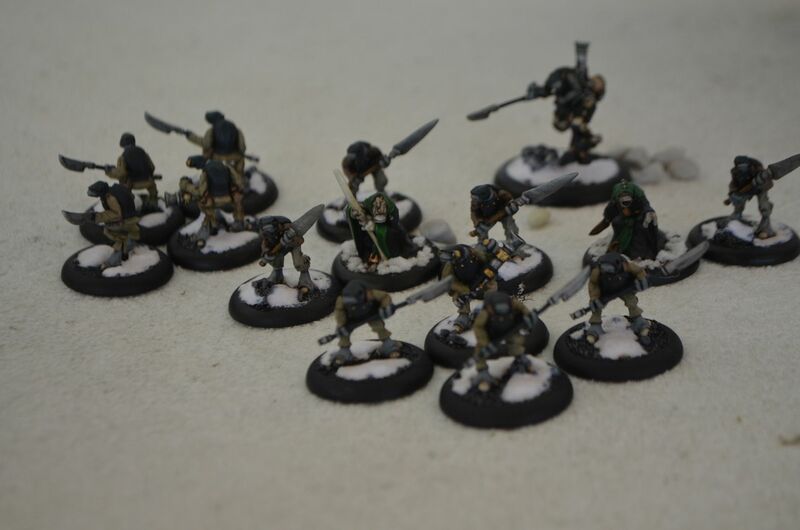 These were then glued with pva to each other and onto the base. 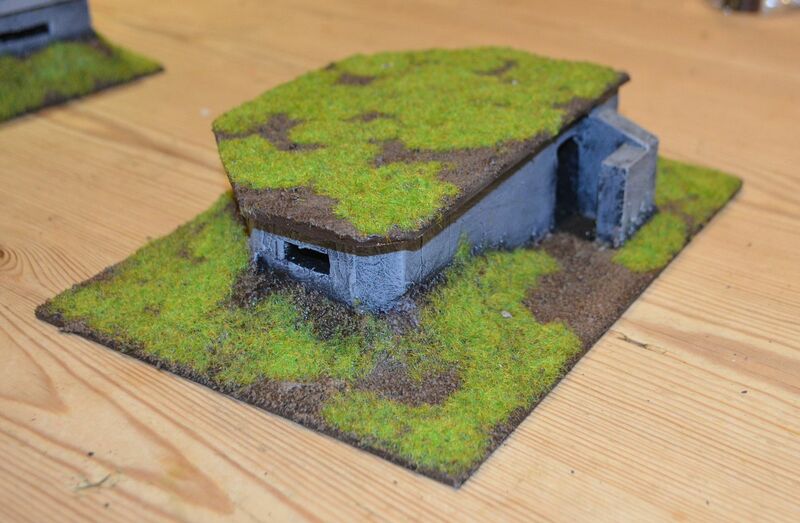 One of the units would have a mortar pit attached. After a few hours they were dry and I could move onto the next stage. I wanted to give the impression that the positions themselves were slightly buried so I needed a bank to run up half way round the walls. This was achieved in two easy steps. 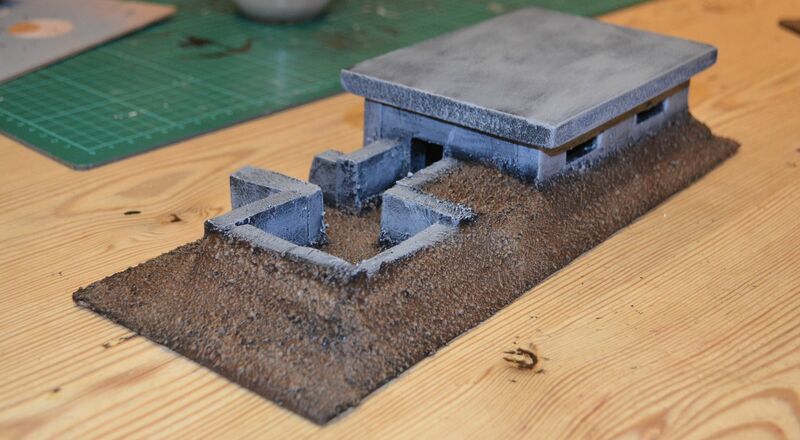 I firstly cut triangular banks from polystyrene (the cheap packing stuff to fit round the outside of the walls. These were glued into position and once dry they were covered in filler to give a hardened surface. Drying time for this stage was about 12 hours. Once dry I didn’t bother sanding the filler as it was going to next be covered in ballast and sand. 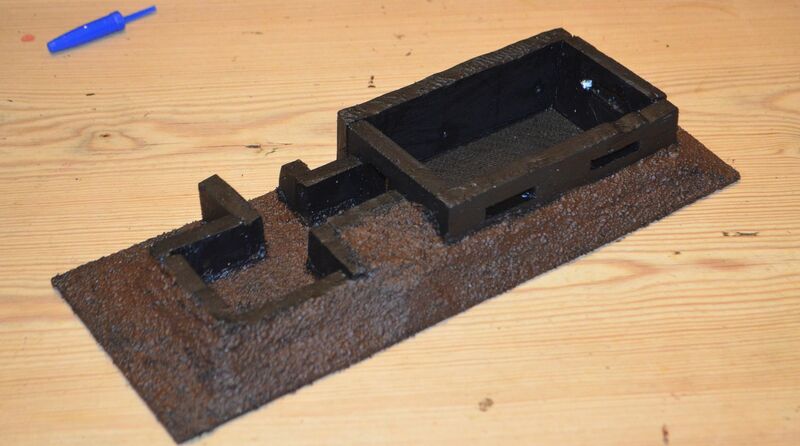 This was fixed using pva – I use so much of this stuff! Again this was left to dry for 12 hours. Each of the following steps only takes a few minutes so I tend to do them just before I go to work – getting up early can be so productive – as I then can proceed with the next step that evening or the following morning. 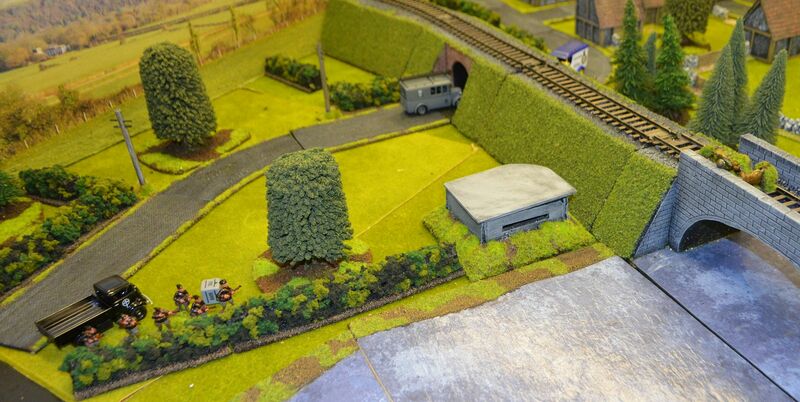 With the sand and ballast fixed the units were then painted black using an acrylic paint. Before I moved onto the final painting I realised that the roofs were yet to be manufactured. 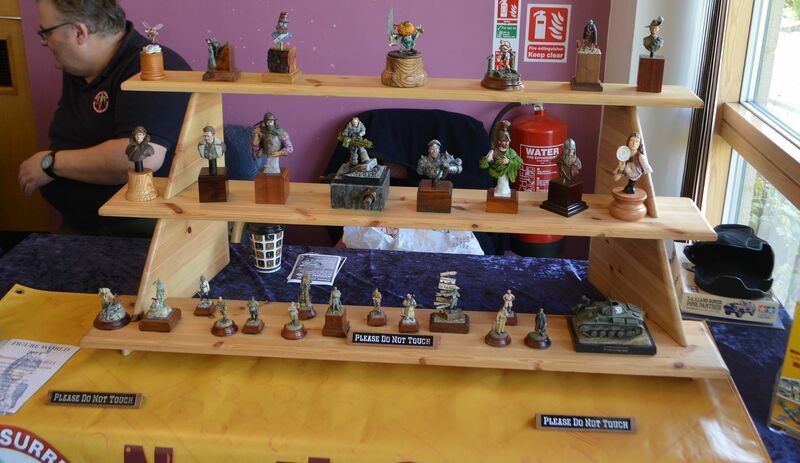 These would be constructed from hardboard. 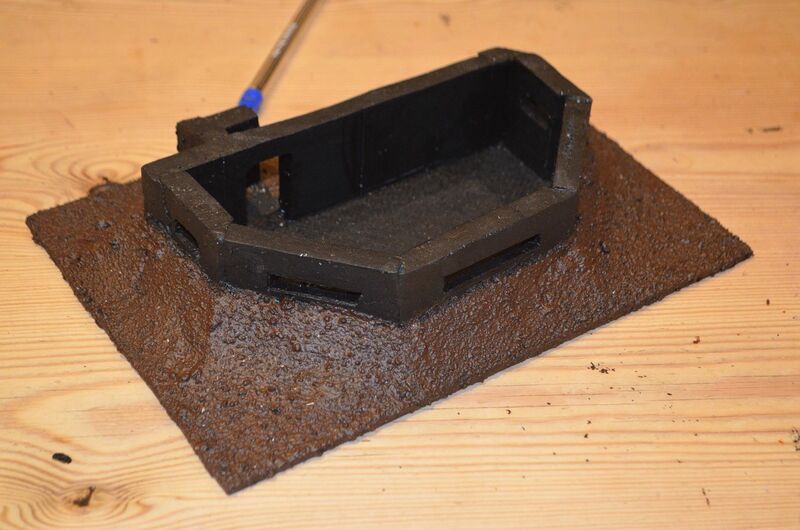 Two units would have plain simple concrete surfaces and the final one would be grassed. 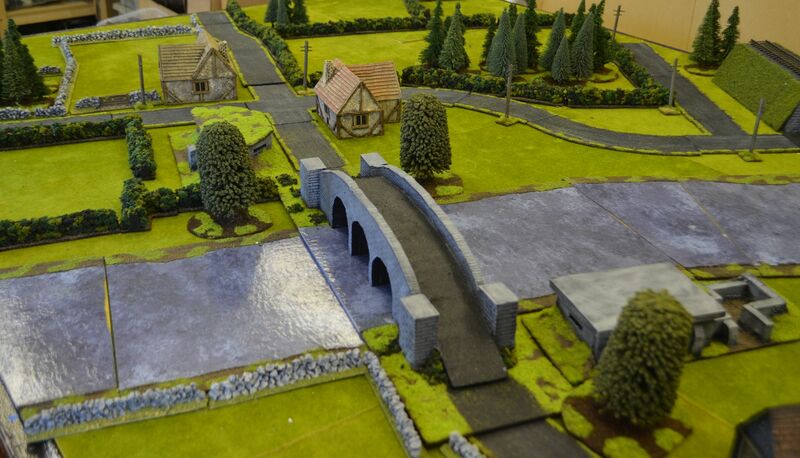 The measurements of the buildings plus a 5mm lip were drawn onto hardboard and cut out. In the case of the concrete tops these would be shiny side up whereas my grassed unit would have a roof rough side up. A piece of foam core the dimensions of the inside of the building was then cut and glued to the underside of the roof to give it a snug fit. 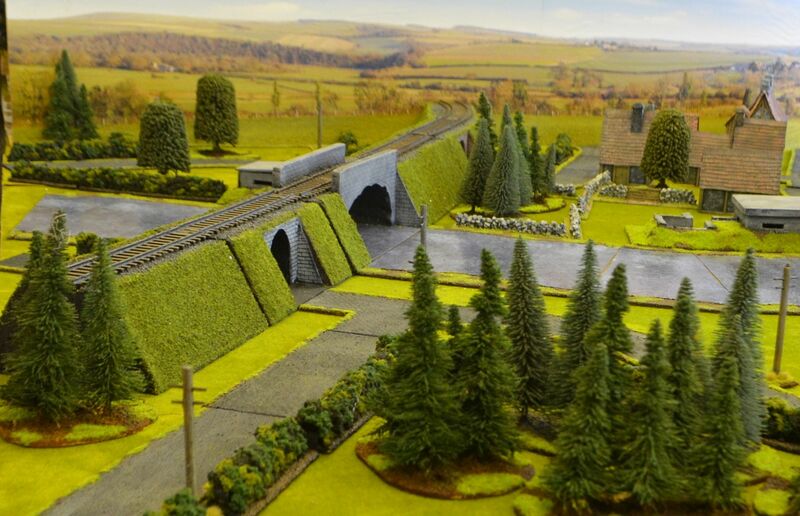 For the grass topped unit I simply covered in ballast and treated this the same way as the base. Onto the final stretch and the best bit. The ground areas were highlighted light brown. 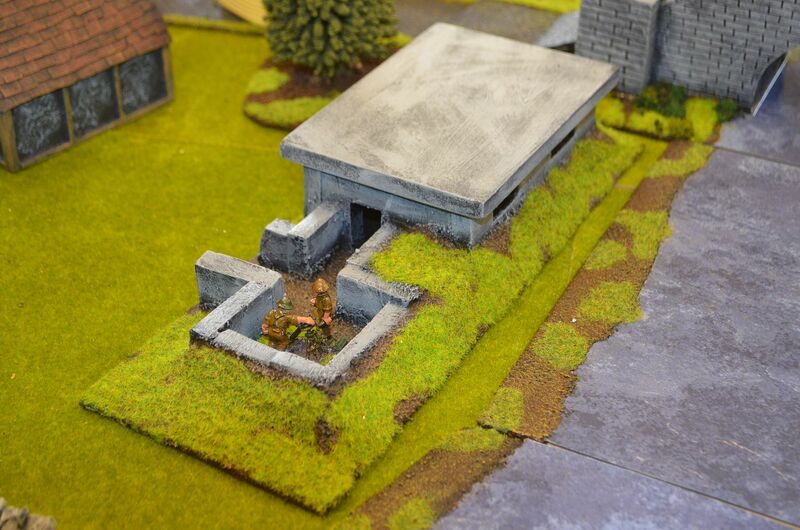 The bunker walls were painted dark grey then highlighted with light grey.